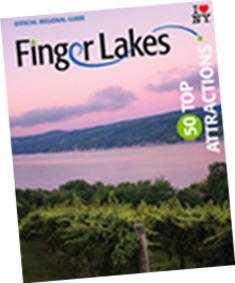 Have a field day in Livingston County, just 35 minutes south of Rochester on the western border of the Finger Lakes region. Take in mother nature’s beauty from the trails of Genesee Valley Greenway State Park and Letchworth State Park. Known as the “Grand Canyon of the East,” Letchworth spans 17 miles long and boasts over 25 waterfalls – including their iconic lower, middle and upper falls with dedicated overlook areas. For a unique view of the park, soar over the tree tops in a hot air balloon or go whitewater rafting through the gorge. Livingston County is home to two finger lakes, Conesus and Hemlock, which are open for boating, swimming and fishing throughout the summer. Tour the Mount Morris Dam – a public park and full working dam built in the 1940s that provides flood protection along 67 miles of the Genesee River Valley. The New Deal Gallery at the Genesee Council on the Arts displays over 200 works of art from the Great Depression. And the National Warplane Museum is dedicated to the restoration and preservation of aircraft from World War II and Korean War eras – many of which are available for flight experiences. The museum is also the host of the annual Geneseo airshow, The Greatest Show on Turf! Other popular events in Livingston County include the Letchworth Arts & Crafts Show & Sale, the New York State Festival of Balloons, Hemlock "Little World&apos;s” Fair and the Genesee Valley Hunt – a day of horse racing and picnicking. And for the craft beverage connoisseurs, don’t miss the breweries, cideries, and wineries! Livingston County has an emerging craft beverage industry, with new stops and old favorites like Dublin Corners Farm Brewery, Original Stump Blower (OSB) Ciderworks, and Eagle Crest Winery, to start.